As the leaves turn brown and the weather cools off, it's finally time to bust out the faux fur vest (last worn here)! I love the concept of playing with textures because when an outfit is lacking in color, it can shine in textures. 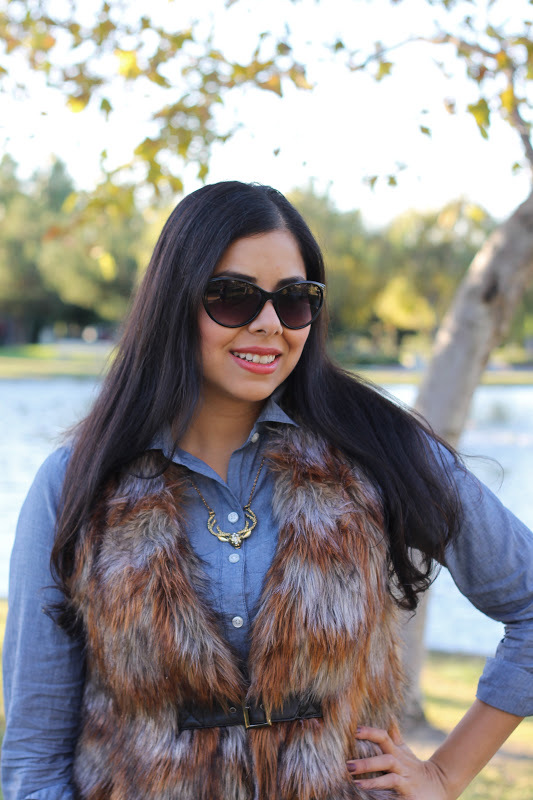 In this outfit, I chose to layer a Faux Fur vest over a chambray top paired with faux leather pants and faux leather booties, all of which have become very popular textures every fall & winter. To top it off, this outfit was really cozy and comfortable! Hope you like it and have a great Wednesday! ☮, ♥ & Thank you for reading! As you know, I adore that vest & necklace! Perfect Fall look & perfect background for the photos ;) I love that "Shop the Look" feature, I might have to do that too! :) Brilliant! what a great vest! I love the way you styled it! Love the vest I need one! lovely outfit.so chic!love the pants and the vest. I LOVE your vest!!!! YOu look fab! I am loving how you styles the vest!! Gorgeous! I am in dire need of some leather leggings!! Love you faux fur vest!!! Thank you for visiting my blog! And sure I would like to follow each other, I am following you! Love the fur vest. I think I'm in need of one as a fall staple now! Bonito look!!! me encantan los chalecos de piel!!! I really like this look. The colors mesh well together. Loving the vest, great staple piece for this season! There's always something so glamorous about fur, regardless if it's real or not.